How To Use Magnetic Drilling Machine As Bench Drilling Machine? A Magnetic Drilling Machine is a very flexible and portable machine for drilling holes at remote locations. It is an ideal machine for the situation where it is difficult to bring a heavy job to a workshop drilling machine. As an alternative one can take the lightweight portable magnetic drilling machine to the job and drill holes. But, the magnetic drilling machine has one restriction when it comes drilling small parts on which there is not enough space to clamp the magnet. For drilling small parts the operator has to use the stationery bench type drilling machines. This problem is now SOLVED! Introducing the new MobilCLAMP from BDS Maschinen GmbH – Germany. The MobilCLAMP is a portable and lightweight clamping device which converts a magnetic drilling machine into a bench type drilling machine. The innovative MobilCLAMP transforms the magnetic drilling machine into a flexible, portable and mobile bench drill. The highlight here is the easy positioning of the magnetic drilling machine on the MobilCLAMP. No screws have to be tightened and no connections to be fixed! It is sufficient to place the magnetic drilling machine on the MobilCLAMP and activate the magnet of the magnetic drilling machine. A perfect and secure connection for the magnetic drilling machine and the MobilCLMAP is created. So this now gives you a very practical solution for an everyday problem. Directions for using a Magnetic Drilling Machine as a Bench Drilling Machine? 1. Get a MobilCLAMP innovative drill stand/clamp device. 2. Attach a Prism Vise to the MobilCLAMP. 3. 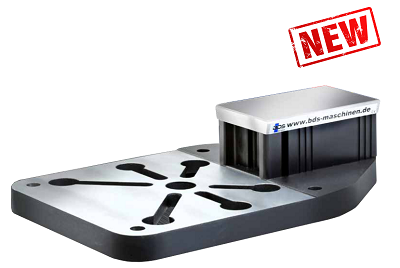 Place the magnetic drilling machine on the MobilCLAMP. 4. Switch on the magnet of the magnetic drilling machine. And you are ready to use the Magnetic Drilling Machine as a Bench Drilling Machine!